Looking for a fun way to work on geography skills? Here's an easy game to play that will help your children review the names and location of each of the 50 states. 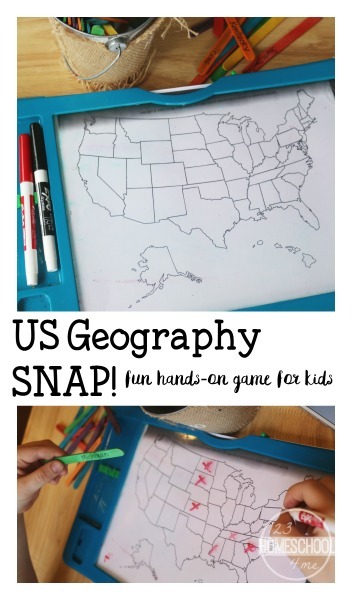 My 8 year old loved this fast-paced US Geography review game and it was even fun for me to play, too! I came across the concept of this game while reviewing my son's spelling list. Since we are trekking around the US learning different regions and states within the US , I thought the SNAP! game would be perfect to review the 50 States. And don't games make reviewing/ learning new concepts fun?! Learn more about how to play over at 123Homeschool4Me! ©2011-2016 School Time Snippets. All rights reserved. You are free to link back to my website but all text, photos, and other content may not be reproduced without the written consent of the author.